DSV today entered an agreement to acquire UTi at the price of USD 7.10 in cash per ordinary share. The total transaction implies an enterprise value of approximately USD 1.35 billion. The per-share consideration represents a premium to the ordinary shareholders of approximately 50% compared to the closing price of UTi on 8 October 2015, and a premium of approximately 34% compared to the 30-day volume-weighted average closing price. The Boards of Directors of DSV and UTi have unanimously approved the transaction. "It is a great pleasure for me to announce the first step towards the combination of UTi and DSV. We complement each other perfectly, both in terms of business activities and geography. Together, we will be even stronger and able to capitalise on business synergies as well as a greater global reach to the benefit of shareholders, customers and employees. 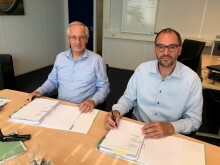 We look forward to joining forces and welcoming our new colleagues from UTi to DSV." 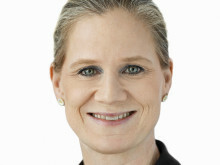 "We are operating in an industry where increasingly scale is critical. Joining forces with DSV delivers substantially greater client value and many future opportunities for our people while it is financially very attractive for our shareholders. As a result, the Board of Directors of UTi has unanimously approved the agreement with DSV and strongly recommends that our shareholders accept the offer." Holders of ordinary shares of UTi will receive cash consideration of USD 7.10 per ordinary share upon closing of the acquisition by way of merger. Following the merger, UTi will become an indirect wholly-owned subsidiary of DSV. Acquisitions are an integral part of DSV's growth strategy, and DSV has a strong track record of successful integration of acquired companies. 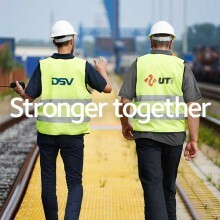 The acquisition of UTi is expected to increase DSV's annual revenue by approximately 50%, creating one of the world's strongest transport and logistics networks. Pro forma 2014 revenue amounts to approximately USD 13 billion (DKK 75 billion) and the combined workforce will grow to 44,000 people in 84 countries, 848 offices and 339 logistics facilities. The Air & Sea Division will be significantly strengthened, and DSV will increase its industry specific capabilities across all divisions. Furthermore, DSV will now be truly global within contract logistics and expand into road freight activities outside Europe. This will enable the company to offer its customers a broader range of services. The combined companies will have a more balanced geographical footprint with approximately 61% of revenue in Europe, Middle East and North Africa, 17% in Americas, 16% in Asia (APAC) and 6% in Sub-Saharan Africa. The transaction is expected to be EPS accretive in year two after closing, and in the long term it is expected that operating margins of the combined entity can be lifted towards DSV's existing levels within the respective business segments. Following closing, further details on the impact of the acquisition will be communicated, including estimates of synergies and integration costs. The content of this announcement will have no impact on the previously announced outlook for the financial year 2015 as reported in the Interim Financial Report H1 2015, dated 4 august 2015. Headquartered in California, US, UTi is a global, asset-light supply chain services and logistics company. In the 12 months ending 31 July 2015 UTi achieved consolidated revenues of USD 3.9 billion and an adjusted EBITDA of USD minus 6 million. UTi employs approximately 21,000 full-time employees in 58 countries across more than 300 offices and 200 logistics centres and offers complete supply chain services and solutions, including air, ocean, distribution, customs brokerage and contract logistics. UTi has a strong presence in North America and a leading position in South Africa. It also operates an extensive network in Asia-Pacific and Europe. In the 12 months ending 31 July 2015 UTi's Freight Forwarding and Contract Logistics & Distribution segments reported revenues of more than USD 2.5 billion and USD 1.4 billion, respectively. As a result, UTi is a global top 20 third party logistics provider. DSV invites analysts, investors and others to participate in a teleconference on 9 October 2015 at 10:00 a.m. CET. A presentation will be available at the DSV website investor.dsv.com before the conference call. 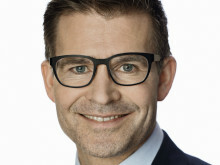 At the conference call, Jens Bjørn Andersen, CEO, and Jens H. Lund, CFO, will present the transaction. Participants will have the opportunity to ask questions after the presentation. No prior registration is required to attend the teleconference. The conference will be accessible via the DSV website investor.dsv.com or via Arkena (http://arkena.eventapi.se/?151009_dsv). The announcement has been prepared in Danish and in English. In the event of discrepancies, the Danish version prevails. DSV invites journalists to participate in a press conference on 9 October 2015 at 12:00 a.m. CET. At the press conference, Jens Bjørn Andersen, CEO, will briefly present the transaction, before inviting questions from the floor. No prior registration is required to attend the press conference, which will be held at the DSV HQ, Hovedgaden 630, DK-2640 Hedehusene, Denmark. This announcement contains forward-looking statements that reflect DSV's and UTi's current expectations and views of future events and developments. Some of these forward-looking statements can be identified by terms and phrases such as "may", "expects", "intends", "anticipates", "plans", "projects", "estimates" and the negatives thereof and analogues or similar expressions. The forward-looking statements include statements relating to the expected characteristics of the combined company; target synergies for the combined company; expected customer reach of the combined company; expected financial results of the combined company; expected benefits of the proposed transaction, including related synergies; transaction timeline; expected revenue and EBITDA of the combined entity; and expected timing of closing of the proposed transaction and satisfaction of conditions precedent, including regulatory conditions. The forward-looking statements are subject to a number of risks and uncertainties, many of which are beyond our control, which could cause actual results to differ materially from such statements. The forward-looking statements are based on our beliefs, assumptions and expectations of future performance, taking into account the information currently available to us. The forward-looking statements are only predictions based upon our current expectations and views of future events and developments and are subject to risks and uncertainties that are difficult to predict because they relate to events and depend on circumstances that will occur in the future. Risks and uncertainties include the ability of the parties to obtain the necessary regulatory approvals and consummate the pending transaction. The forward-looking statements should be read in conjunction with the other cautionary statements that are included elsewhere, including DSV's most recent annual and quarterly reports available at www.dsv.com and UTi's most recent annual report on Form 10-K, quarterly report filed on Form 10-Q, and reports filed on Form 8-K, and any other documents that DSV or UTi have filed with Danish FSA, NASDAQ Copenhagen or the SEC, respectively. Any forward-looking statements made in this release are qualified in their entirety by these cautionary statements, and there can be no assurance that the actual results or developments anticipated by us will be realised or, even if substantially realised, that they will have the expected consequences to, or effects on, us or our business or operations. Except as required by law, we undertake no obligation to publicly update or revise any forward-looking statements, whether as a result of new information, future events or otherwise. In connection with the proposed transaction, UTi will file with the Securities and Exchange Commission (the "SEC") and mail or otherwise provide to its stockholders a proxy statement regarding the proposed transaction. BEFORE MAKING ANY VOTING DECISION, UTI'S STOCKHOLDERS ARE URGED TO READ THE PROXY STATEMENT IN ITS ENTIRETY WHEN IT BECOMES AVAILABLE AND ANY OTHER DOCUMENTS FILED WITH THE SEC IN CONNECTION WITH THE PROPOSED MERGER OR INCORPORATED BY REFERENCE THEREIN BECAUSE THEY WILL CONTAIN IMPORTANT INFORMATION ABOUT THE PROPOSED TRANSACTION AND THE PARTIES TO THE PROPOSED TRANSACTION. Investors and security holders may obtain a free copy of the proxy statement and other documents that UTi files with the SEC (when available) from the SEC's website at www.sec.gov (link is external) and UTi's website at www.go2uti.com (link is external). UTi and its directors, executive officers and employees may be deemed, under SEC rules, to be participants in the solicitation of proxies from UTi's stockholders with respect to the proposed acquisition. Stockholders may obtain information regarding the names, affiliations and interests of such individuals in UTi's Annual Report on Form 10-K for the fiscal year ended 31 January 2015, and its definitive proxy statement for the 2015 annual meeting of shareholders. Additional information regarding the interests of such individuals in the proposed acquisition of UTi by DSV will be included in the proxy statement relating to such acquisition when it is filed with the SEC. 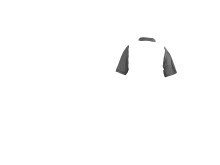 These documents may be obtained free of charge from the SEC's website at www.sec.gov (link is external) and UTi's website at www.go2uti.com. 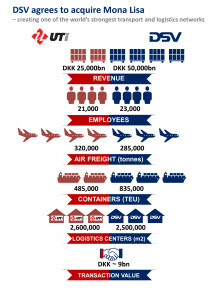 DSV is a global supplier of transport and logistics services. We have offices in more than 70 countries and an international network of partners and agents, making us a truly global player that offers services worldwide. The effective, professional solutions provided by the company's 23,000 employees enabled DSV to record worldwide revenue of 6.5 billion euro for 2014. Please contact me for all investor relations enquiries.